Getting from England to Wales is easy, especially for those using a coach hire with driver. The main route is the M4 through Severn Bridge, which takes about three hours for those departing from London. It is also possible to reach Wales from Birmingham, Liverpool or Manchester. Driving directly to Wales in a personal automobile is fast and provides a great deal of flexibility. Aside from the M4, other routes that can be used include the M56, M5 and M6. By using a car you can travel at your own pace and stop at any location along the way to take in the surroundings. However, there are a number of downsides to this mode of transport. First, it is not a good option for tourists visiting the UK who in most cases are not familiar with the roads, local driving habits, and how to get around. Second, visitors to the country will probably need to rent a car, for which they will be responsible if it sustains damage. Finally, those who travel to Wales by car will also be expected to pay a toll. Travelling by train is another common way of reaching Wales from England. Rail routes and stations can be found in the Paddington area of London, as well as Bristol and Reading. Passengers can also travel to Cardiff or Newport which has direct rail line connections to Pembrokeshire, Swansea and Carmarthenshire. There are also trains which can be taken from London directly to Holyhead, Llandudno and Bangor or from Birmingham and Shrewsbury to the Wale Coast. Those in Shrewsbury or Manchester can also travel by way of Newport or from Southampton to Cardiff. Transport by train will take approximately two hours depending on route. Aside from speed, another benefit to using a train is that you don’t have to worry about paying tolls or renting a car, but the tickets can be expensive depending on the seating option you choose. 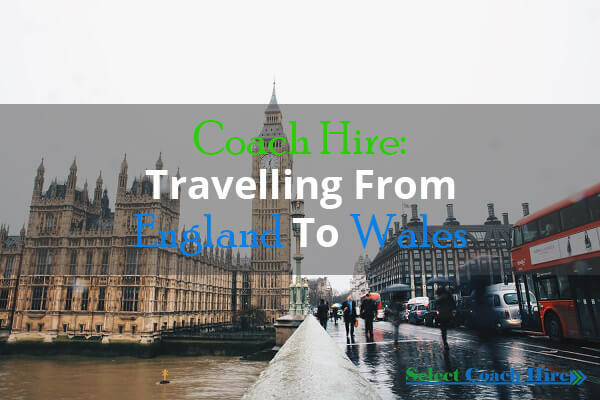 Coach is the most popular method for reaching Wales from England, and this is partly because of the extensive network that has been created which connects prominent cities and towns throughout the United Kingdom. For instance, you can travel from London to Cardiff, or reach Wales by way of Birmingham. It is also possible to connect to Cardiff via Nottingham. UK coaches are spacious, comfortable and reasonably priced, especially when compared to travel by air or train. Furthermore, one does not have to worry about the hassles involved with renting a car, navigating the streets and roads, and paying toll fees. The seats are relaxing; Wi-Fi is also available along with heating, cooling and clean toiletries. Passengers can just sit back and take in the English countryside as they are transported to their destination. The country of Wales is within the UK and geographically distinctive for its extensive coastline and mountains. Although primarily agricultural in the past, it evolved into an industrial economy during the 20th century and today has a strong service sector. Popular attractions that can be found here include the Brecon Beacons National Park, which is outstanding for hikers due to the nearby River Usk and Black Mountains, as well as the many wild ponies that roam, and Caernarfon Castle, which is a 13th century fortress that was constructed by order of King Edward I. It is one of the region’s largest castles, and served as the Prince of Wale’s seat. It has more than a dozen towers and is considered by historians to be one of the best preserved castles from the Middle Ages. Visitors to Wales also enjoy touring Pembrokeshire Coast, which is a peninsula that can be explored on foot. It has villages which are enclosed by medieval walls and aside from the nearby fishing harbour; one can also see St. David’s Cathedral, museums, cottages and classical railcars. Botany enthusiasts will not want to leave without visiting Bodnant Garden, which was constructed by the McLaren’s and is one of the country’s most beautiful estates.